The Presidents Choice is the most complex pre-placement education offered in the canine world and usually requires twelve months from request to placement. Costs are based on the situation presented. For those who know the advantages of education advancement and can invest in the Canine, the Presidents Choice Program is "a must do" addition to an already outstanding development program. In effect, extending all programs in all experience levels until Mr. Hoytt is satisfied that this Presidents Choice is ready before they head home make the most unique canine companion in the world. This step is equivalent to having completed the canine version of a Bachelors Degree. But don't expect to find one readily available just because you can write the check! Our Presidents Choice can take a year to create from the date of purchase. Of course, you can call Mr. Hoytt and find out if a Presidents Choice might be nearing graduation. It is possible that a Dobe can be nearing completion and available for a home. With the training exercises required to compete the Presidents Choice outlined in our web site, all you may need to know are a few extra points: about three hours of formal competition and obedience according to the rules and regulations set by the American Kennel Club are needed before completing this step. We have outlined the rules at the end of this section. There is as well, many additional months of home rule, life outside the home, and the additional time away from the kennel working under varied conditions to help prepare the Dobe for the stress and confusion of world we humans must deal with outside the comforts of our "personal space". The obedience ring demands a 4 point average. For the canine to gain it's degrees at the young age expected of a Hoytt Dobe, Hoytt history means not only must the Dobe gain an exceptional understanding of it's alphabet, it has to be a quick study. The private life that relates to seeing or experiencing unexpected perhaps better put unknown and without taking months of reintroduction works out whether it is something to be causes of or accept as part of life. Travel time, travel rules and manners away from home both in and around crowds are further enhanced when you realize that on average a handler will travel round-trip 1000 miles and spend three days living out of motel rooms for each show attended. Further, at the show the dog and handler will spend three to six hours at ring side. Additionally, the dog must be under control at all times. An added bonus is that the canine student and its teacher now spend literally every hour side by side each day away from the kennel. At all times, even during "fun time", the young Dobe is being educated to the ways of man away from the primary residence. This is a program that usually begins when the pup is under ten weeks of age. Weeks before, however, its teacher has already built a relationship with the pup, so all that remains is the program that will take the pup to the age of acceptance in the ring, (AKC rules restrict a dog from entering any ring competitive exercises until the age of six months). When the canine student's handler/trainer believes the young Dobe is ready, off to the shows they go. During many of these shows, the handler's helper will video these special moments so the "family' does not miss out on what is looked upon as the bachelor's degree of the dog world. The costs include all training to completion of title, handler fees, entry costs, and related travel expenses. Upon completing the required wins, the American Kennel Club will issue the title certificates, and an acknowledgment letter of accomplishment from the Doberman Club of America. The young Hoytt Dobe then carries on its pedigree; the coveted title, Companion Dog (CD), along with its earlier gained titles. From that moment, this deserving Dobe will forever be part of its breed's competitive documented history. 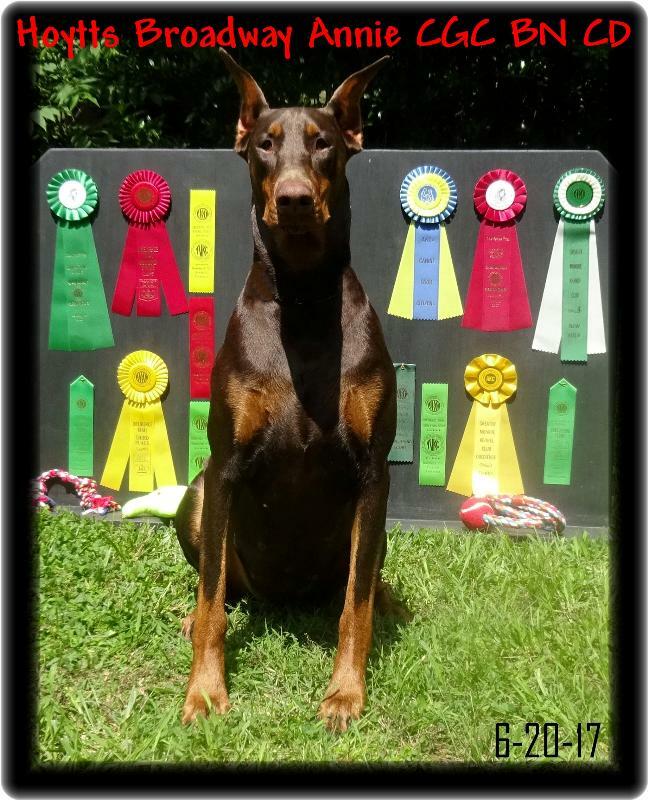 Final price includes "TOP DOBE SELECT" classification pup, full medical services, as well as all development costs related to home manners, house rules, public exposure, and further experiences, In addition to the extensive obedience program to gain the AKC performance titles as outlined. Handler fees are added related to the showing for the various certifications as well as travel-related fees. (Note* An outline of each program with more details can be emailed directly to you).